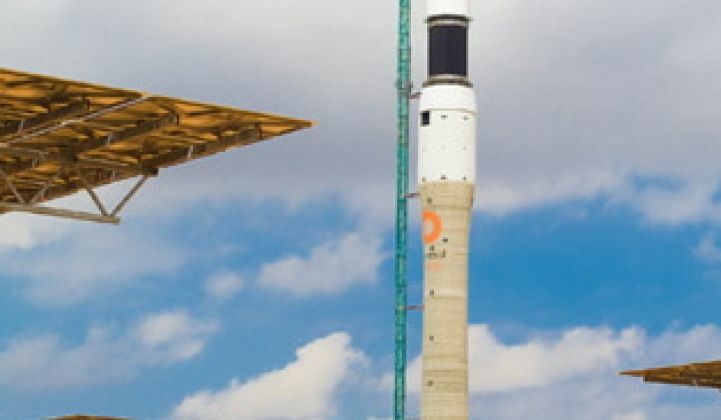 Independence from fossil fuel-powered plants via molten-salt storage? A common refrain about the limitations of solar power is that it only works while the sun is shining. That's certainly true of photovoltaic (PV) solar technology. Concentrating solar power (CSP), while more expensive than PV technology with its recent runaway cost plunge, has an absolute advantage over PV -- the ability to store thermal energy long after the sun goes down. This quality improves CSP's capacity factor and dispatchability, and has the potential to improve CSP's levelized cost of energy (LCOE). The 19.9-megawatt Gemasolar CSP power tower plant in Seville, Spain (see pictures below) has just set a milestone for solar power plants -- it offers 24 hours of uninterrupted operation. This is a first, according to Torresol Energy (a joint venture between Masdar and Sener). 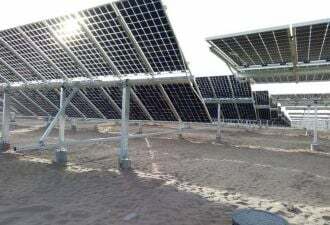 The system is capable of 15 hours of electricity production without solar radiation by storing the thermal energy in molten salt (15 hours applies to sunny summer days). The salt storage system allows the plant to stretch its electrical production hours beyond sunset, regardless of cloud cover. The 19.9-megawatt steam turbine can supply electricity to a population of 25,000 households using a 140-meter-tall tower and a field using 2,650 heliostats. That's small by BrightSource Energy standards with its more than 300 megawatts and 173,000 heliostats -- but BrightSource doesn't incorporate storage. 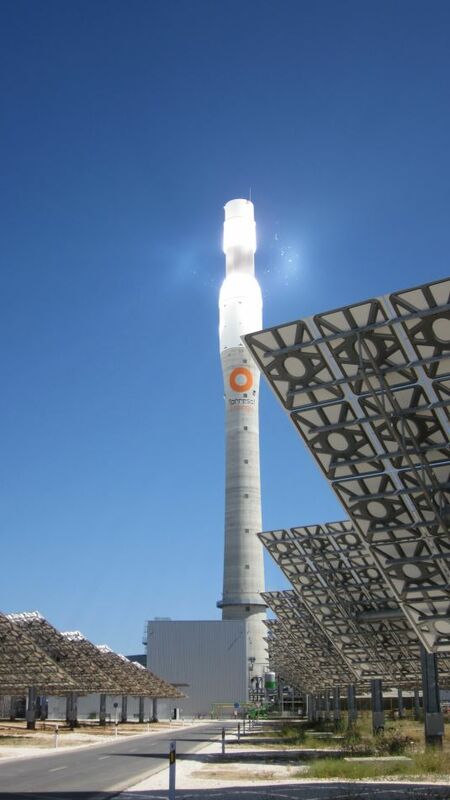 Molten salt storage has been used with trough CSP systems, but Gemasolar is the first plant to use the thermal-storage system in a central "power tower" and heliostat architecture. The system dispenses with oil and uses molten salt as a transfer fluid -- allowing for a much higher operating temperature (over 500°C). That translates to hotter steam, higher pressures and improved plant efficiency. This accomplishment would seem to change the real practicality of solar power if the costs are right. But at the moment -- the costs are not right. 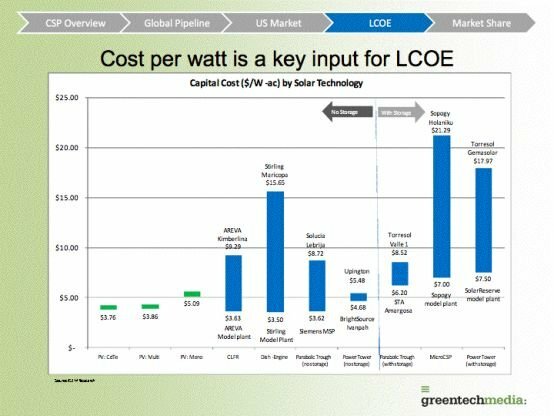 Brett Prior, a senior solar analyst at GTM Research, has looked at the LCOE economics of CSP in a recent report, Concentrating Solar Power 2011: Technology, Costs and Markets. 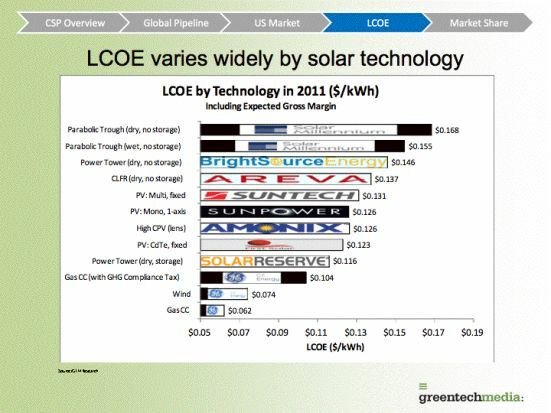 Cost per watt -- a key piece of the LCOE calculation -- is very high for the Gemasolar plant. (See chart below and report for more details.) Gas combined cycle plants are a mature, dispatchable technology and have an LCOE of $0.062 per kilowatt-hour. That is the harrowing number that solar and all new energy must compete with if going after baseload, dispatchable, wholesale power. Another entrant in the CSP with molten salt storage field is Santa Monica, Calif.-based SolarReserve, which is building a 110-megawatt solar thermal plant in Nevada with help from a $737 million DOE loan guarantee. Solar Reserve has set its wholesale price for electricity at 13.5 cents per kilowatt-hour, according to this interview with Marc Gunther.